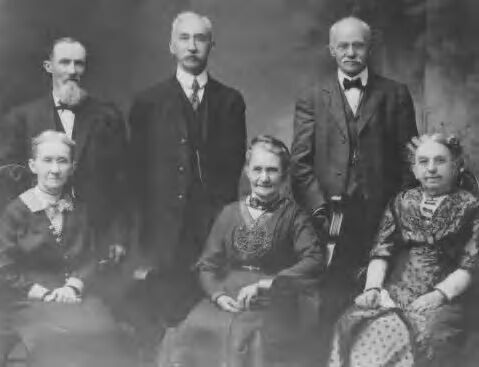 Comments: Nancy Ellen Smith (Nee: Parker) | Scottdale PA United States | 1901-1920 | Comments: A photo taken in 1915 of surviving siblings of the John S.,I and Jane R (Graham) Parker family. Sitting (L-R) are Euphemia (Parker) Hurst [76 yrs], Harriet (Parker) Ruff [81 yrs], Nancy Ellen (Parker) Smith (78 yrs]; standing (L-R) are Richard Parker [71 yrs], J.S. [73 yrs], George Chalfant Parker [68 yrs].